This KB reviews the information for accessing the new Course Reading List or Reserves Reading List. In Fall of 2018, Madison will be retiring the LCPs and moving to a new Course Reserves platform. This platform uses an application that brings the campus timetable, Alma and Canvas together. 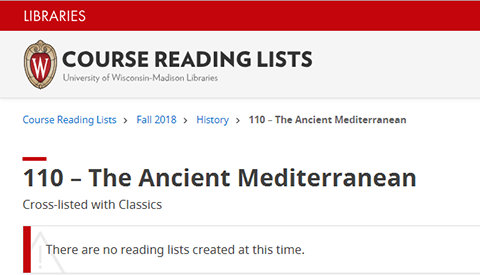 The public can view the course reserves offerings via the Course Reading Lists application found here - https://courselist.library.wisc.edu. This will be linked off the webpage under the Find tab and also the Services tab. Search for the course by department and then number and name. If the application says - There are no reading lists created at this time. Then there are no Reading Lists set up for the course yet. (These show up in real time). If you think there should be a reading list, please follow up with your local reserves staff. If there is a Reading List set up there will be a link to the Reading list. 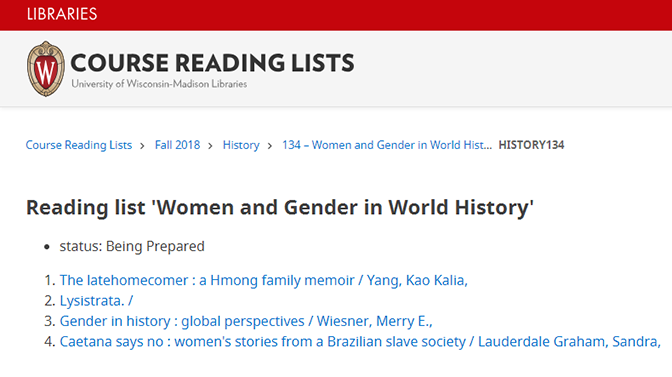 The reading list will include a link of the content as it is set up in Alma and will take the user out to the Library Catalog to find out which library has the item on reserve. If there appear to be duplicate titles in the Reading List, rest assured this is okay. This is Alma's way of listing multiple copies of the item. 2. 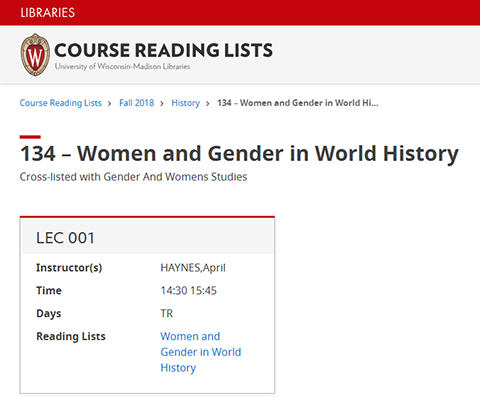 Students can also access their Reading Lists within their course in Canvas, provided the instructor has activated that module.